Broken Age is a true-to-it’s roots, don’t-get-much-clicker-than-this point and click adventure game developed by Tim Schafer and his own Double Fine Productions, whose famously successful ~3.3 million dollar Kickstarter campaign is, given the lack of specificity about the game being created at the time of funding, arguably far more widely known than the game itself. Now that might be rather unfair to say at this point, since the Act 1 of this big budget game was only released at the very end of January 2014 without the advertising advantages of being funded by a traditional publisher, but the amount of discussion, internet publicity, and general splash that trend-setting Kickstarter campaign generated comparatively dwarfs most conventionally published video game releases. A revolution in which crowd funding began to flow freely from the wallets of fans into the bank accounts driving many otherwise penniless creative forces had been born out of what appeared to me as an unquenchable fan-thirst for a Psychonauts 2. 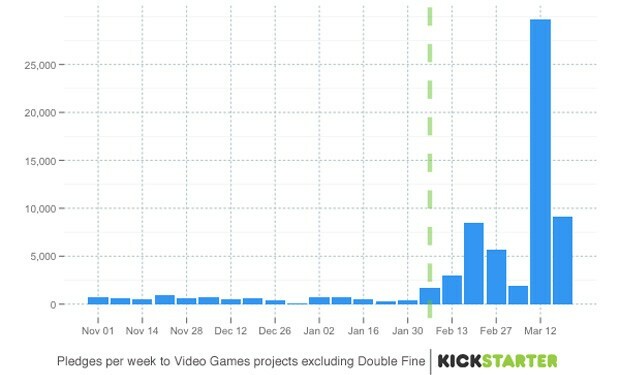 Nifty graph from Endgadget showcasing the drastic influence Schafer’s Kickstarter had on the frequency of other project donations. While the mention of paratext might initially summon reflexive urges to look at book covers, which in the case of a digitally distributed game might equate to the visuals of the start menu or any other such required gateway to the narrative content, I feel the context surrounding this game’s creation and funding provide a context that can potentially color the perception of the game’s story to a degree that must be considered for a holistic interpretation of this game. Don’t get me wrong- the entirely hand-painted gateway through which players enter the game is damn gorgeous, but that presentation is more of an enticing, appetizing snippet of the eye-watering visual feast Broken Age consistently integrates as a graphical narrative than a uniquely informative and different paratext. At least this close to the release, the surrounding discussion about the Kickstarter context is practically a cover page. Given the lack of certainty from day one of the kickstarter about what the game would be and what I’ve observed by following this game’s production at various stages, it is my impression that most backers and other people who took interest in the project didn’t necessarily have definite expectations. Considering the cult following surrounding Schafer and Double-Fines post-Lucas Arts break-through title Psychonauts, the excited speculation that a sequel might be in the works should have been no surprise. However, the hyped followers started becoming unsettled when Schafer announced, along with a tentative screenshot which many were none too pleased with, that this would be a point-and-click-adventure game as somewhat of a spiritual follow-up to his last foray into the genre under Lucas Arts when he spearheaded Grim Fandango in 1998. Schafer’s choice of point-and-click adventure was very purposeful, as he specifically stated he wanted to take this wonderful funding opportunity to create a game that could never be produced through traditional publisher financing. It unfortunately doesn’t come as much of a surprise to me that an utterance of the adventure genre in a proposal to a publisher will only be met with laughter 99% of the time. This seems to be Schafer’s effort to be as respectful as possible with the fan money and the unique opportunity he was given, but regardless he received a great deal of backlash from backers and followers alike when the adventure genre didn’t mesh with whatever expectations they might have had. Big budget games as we find through traditional publishing could certainly be argued as setting a standard of high polygon counts and advanced rendering techniques, such as the flashy realism that can only exist within the cutting edge that big budget game development allows. It’s hard to say whether this was a leading source of disconnected expectations in Broken Age’s case however, considering none of Schafer or Double Fine’s previous works sniffed of anything besides creative, unorthodox, witty world and character building that transcended the limitations of more basic technology. That being said, I do believe there is a strong disconnect that most with knowledge of Broken Age’s greater context experience in the form of disassociating the point and click genre as being a big budget title. A superficial gleaming of the game might even leave a player confused about where the money went. Having blasted through the first act in a single sitting, and spent every moment savoring the love, effort, and -as shallow as it might sound- the novelty of a big-budget graphic adventure game that Broken Age offers, I clearly see where that 3.3 million went, and considering how much of that went to the costs of documenting the development process I am dazzled. I still don’t believe the plethora of brilliant indie devs that produce great gaming experiences that the more corporate side of the industry doesn’t encourage need the immense funding required to hire voice talents such as Elijah Wood or other such premium resources, but seeing what can be accomplished when a genre that would otherwise never see such storytelling luxuries is woven together with the specific flavors of narrative and artistic flare that are lost to common big budget genres is truly a beautiful experience for anyone who enjoys a game that plays like a piece of quality literature reads. I’ll admit I’m a sucker for quality voice-acting and hand-painted visuals in particular, but I believe that investment in both of those fields harmonized beautifully with Schafer’s style of characterization, storytelling, and worldbuilding- from my amateur perspective I can honestly think of no better place he could have put the money. Broken Age defies the notion that there is an acceptable investment price tag for each genre that should only sink as it loses the certainty of mass appeal, and the subsequent blossoming of Kickstarter offers the promise for future genres with more niche appeal to see a wider variety of resources. The previously set molds and standards for digital storytelling are shifting and warping, even if only a little. It’s so difficult to come across an artistic video game in such a narrative-heavy genre as the point-and-click adventure with so many resources that tries to convey so much through such simple gestures, and that is what Broken Age does. Unless you manually turn on the subtitles, the first actual words you’ll read are likely to be the words “Up for grabs” woven into the back of the dress Vella, one of Broken Age’s two protagonists, is forced to wear as she is offered up to a Lovecraftian eyeball monster- probably a good 15-20 minutes into the game. This is probably the most text on the screen from any point in Act 1. In the end, the buzz surrounding the controversies of such a large investment is overshadowing the discussion about the game itself, and likewise interpretation and reception of this game will inevitably be colored by this paratext of the greater Kickstarter discourse it sparked. Some may ignore the paratext and appraise it as standalone media just as others might ignore the disorienting cover art of Zork- as with any artistic work there is no definitive experience or interpretation. Still, as frustrated as I may be with all the reductive fussing about the projects funding clashing with gut expectations for a big budget Tim Schafer game, I believe there to be a great deal of room for interesting discussion of Broken Age in the context of it’s controversial and unique beginnings. Not just as “that one kickstarter that made 3.3 mill and started the other kickstarters,” but as an interesting, beautiful, and unique development within a genre of electronic storytelling that rarely sees so many resources. ← Heuristic Intrigue: Why is eLit so Exciting? Broken Age is freaking gorgeous. A friend bought the game on Steam and I’ve had the pleasure of perusing around the game’s stunningly artistic world. The Secret of Monkey Island was one of my favorite games as a kid, and is generally what I associate with the point and click genre in general, so its great to see Tim Schafer back at doing what he does best. I was unaware of Broken Age’s Kickstarter origins, though the large budget does work to explain the somewhat lofty $25 price tag, especially for a point and click. Anyway, I’m excited to see someone writing about this game, especially considering how recently it was released. I really liked how you pointed out paratext and its effect on perception because, to be completely honest, I first wanted to read this post because of the images you’ve uploaded. I think it says a lot about consumerism and how things like paratext and advertising techniques can affect how something is perceived. Also, given that this is something that seems like it is meant for more of a niche rather than a broad audience, I find the correlation between the point and click aspect and its two-dimensional aesthetic, not to mention the fact that it was funded through a kickstarter. I also find it interesting how you point out that the simplicity and lack of being a text heavy game is actually what makes it so worthwhile. You also mention the emotional response that the game is able to bring out in its players. I think, by even comparing one sequence to Every Day the Same Dream, we as an audience are able to see the intricate beauty in simplicity because, despite it, there is an interesting dichotomy between the simplistic and the complex. And throughout it all, there is still something about a strong, character driven plot that can attract a crowd.